National University Honours Admission Result 2018-19 will be found my website. National University Honours Admission 2017-18 online applications start 24th August 2018 and continue up to 20th September 2018. National University Honours Admission test 2018-19 this year no admission test. This year National University honors admission only SSC and HSC marks position merit list publish. National University is one the largest Public University in Bangladesh. The National University authority already publishes Honours 1st Year Online Admission 2017-18 procedures. National University Honours Admission Result 2018-19 will be published maybe last week November 2018. 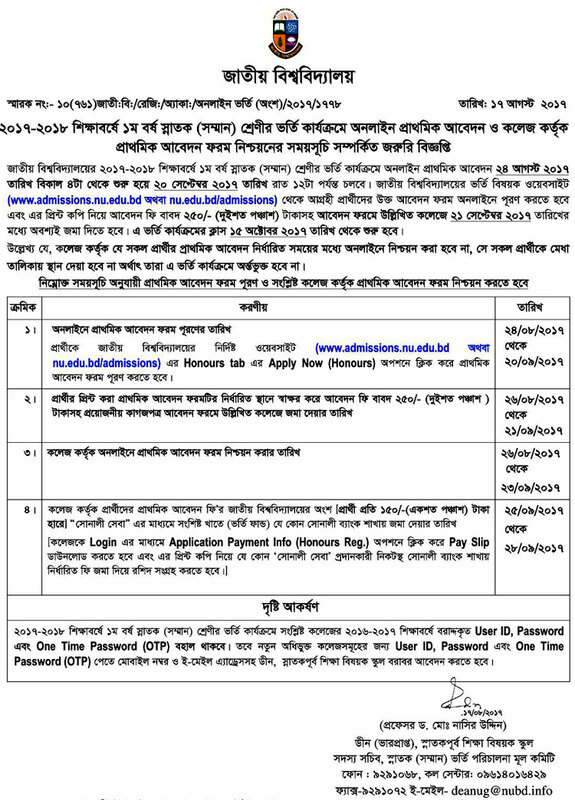 National University the largest public university of Bangladesh, invites online application from eligible candidates for admission into 4 years bachelor honours programs in different subjects. Interested candidates have to apply online at National University website www.nu.edu.bd. National University honours admission online application will start from September 24, 2018. NU honours 1st year class for the academic session 2018-19 will begins from November 15, 2018. Admission Test will not be held for National University 1st Year Admission for the academic session 2018-19. National University Honours Admission Result 2018-19. Candidates must pass SSC in 2014/2015 and HSC in 2016/ 2017. Applicants must have total GPA-4 (with the 4th subject) both in SSC and HSC examination. Candidates must have at least GPA-2.0 (with 4th subjects) in both SSC and HSC each. See more details on the circular which can be downloaded from below. All courses are conducted by National University. National University is administrative bodies of Degree pass colleges and University College. All admission process and Examination conducted by National University. National University Honours Admission Result 2018-19.